A topology map is one of the most commonly used network management tools. Current networks are large, dynamic, and form the backbone of business continuity. To maintain optimum performance and network health, as well for better operational troubleshooting in order to ensure business continuity, a comprehensive view of the network is essential – and a network topology map can provide this. 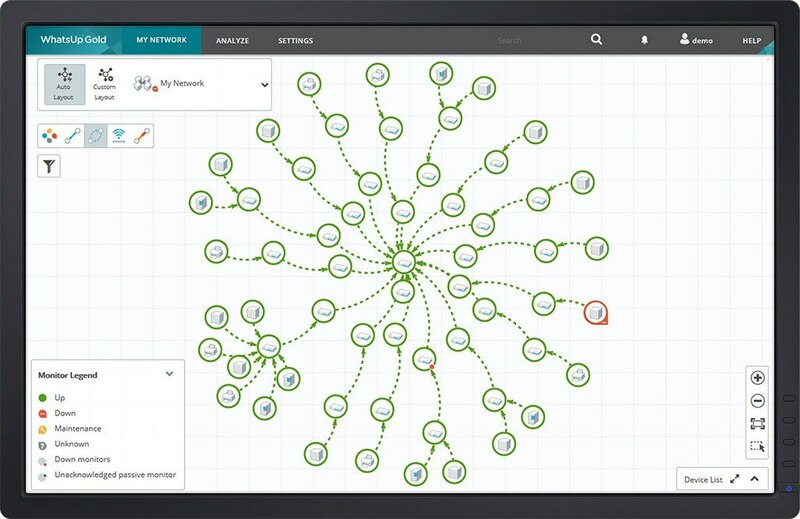 By visualizing the network’s devices, their interconnections, location and interdependencies, administrators can monitor network devices, proactively identify failures/bottlenecks, and reduce the MTTR, thereby ensuring better disaster recovery/ business continuity. Moreover, a detailed topology map is now essential for compliance regulations like PCI-DSS. WhatsUp Gold’s discovery and mapping tool uses Layer 2 and Layer 3 discovery methods to create comprehensive network topology maps showing all network elements including routers, switches, VLANs, physical and virtual servers and workstations. The tool comes with a high degree of customization, and any aspect of the topology and individual links can be hidden/displayed. Built-in features include drag-drop functionally; displaying device-monitor correlation displayed on the map; displaying device details like attributes and status alongside the device icon; and a choice of spoke/ hierarchical/ custom views. By correlating Layer 3 addressing to Layer 2 maps, WhatsUp Gold provides a comprehensive, integrated Layer 2/3 topology map that shows both IP and interface-level connectivity.